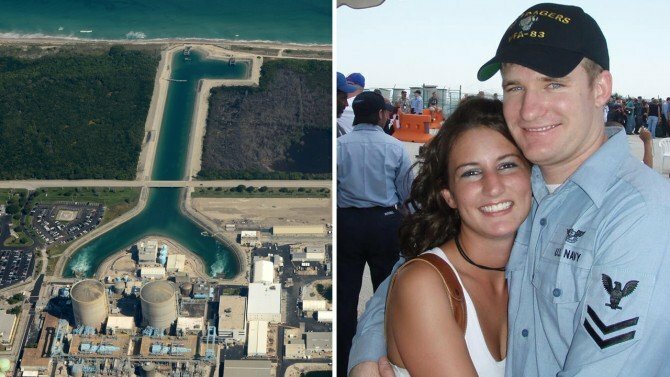 (P1) A South Florida SCUBA DIVER was taken on a TERRIFYING ride through a nuclear power plant’s INTAKE PIPE that he feared would end in his watery death. (P2) What started as a trip with family and friends became what felt like a ride to hell for Christopher Le Cun last summer when the 30-year-old swam up to what he says was an improperly marked intake pipe to a nuclear plant in Port St. Lucie. (P3) For some five minutes back in July, Le Cun was pulled along at seven feet per second through a PITCH BLACK pipe with no idea what lay at the other end. (P4) They were five minutes Le Cun said will forever be IMPRINTED on his mind. (P5) “We were looking for lobster when we came across a big structure,” Le Cun, a Navy VETERAN who’s been diving since age 12, said. (P6) Le Cun and a friend put on their dive gear and left behind Le Cun’s wife, two children, and a friend’s child. (P7) As they investigated what he said looked like “three underwater buildings,” Le Cun said the current began to speed up. He didn’t think anything of it, at first. (P8) “Then suddenly I’ve lost control and I’m being sucked into the intake pipe,” he said. (P9) He feared the worst, as if he was in a HORROR FILM. (P10) Le Cun said he even considered DETACHING from his scuba equipment and ending his own life before he reached the end of the pipe. (P11) “But then I though, I got a family. You’re gonna have to kill me. I’m thinking about my wife, who was pregnant with our third child at the time,” he recalled. (P12) Then Le Cun discovered he was in a RESERVOIR for sea water used to cool NUCLEAR REACTORS. A plant employee spotted him and couldn’t believe his eyes. (P13) Le Cun borrowed a phone and called his wife. “I’m alive,” he told her, as she wept with her children and friends. (P14) Le Cun’s friend Robert Blake had seen his friend get sucked into the intake pipe and was sure that he was dead. (P15) Now Blake and Le Cun are arguing that there was no warning of the dangers at the intake pipe and that Florida Power and Light failed to properly mark the site. (P16) Le Cun, who says he’s still TRAUMATIZED by the incident and isn’t comfortable scuba diving any more, is now suing the company. (P19) Meanwhile, Le Cun says he has an entirely new OUTLOOK on life as he spends all the precious time he can with his wife and children. (P20) “I am absolutely lucky to be alive,” he said. Why is the power company’s version of this incident different than the diver’s? Have you ever gone SNORKELING or scuba diving? What was your scariest experience?